Slim Ray is an internationally-recognized authority on flood, swiftwater and whitewater safety and rescue with twenty years of experience in swiftwater rescue, including course development and instruction with Rescue 3, Canyonlands Field Institute, and the Nantahala Outdoor Center. He has written and lectured extensively on the subject. 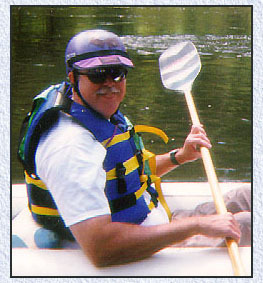 An active recreational kayaker, he has worked as a raft guide and canoe and kayak instructor both in the US and abroad. He has been the American representative in several international river safety conferences and organized the International Safety Symposium (ISS '90) in the US. He is currently the owner/CEO of CFS Press. We've put most of our effort into flood prediction, and we've gotten pretty good at it. You don't see huge events in the United States like they get in Bangladesh or Somalia where you have thousands of people killed. But for some reason there's a blind spot about the need for special training in swiftwater rescue. Several hundred people get killed every year in flooding. Those numbers could be greatly reduced with improved swiftwater rescue management. Pre-deployment of swiftwater rescue teams is a whole new concept for officials to deal with. But it's absolutely necessary for saving lives, because in the typical flood scenario, the first few hours are the most critical. The really life-threatening rescues are made on the spot, and you've got to be there. If swiftwater-rescue trained people are not there when it happens, it's too late. After one of these emergencies starts happening, there's not much point in bringing in a swiftwater rescue team with a six-hour response time. Too often, the actual swiftwater rescues are done by people who are on the spot, regardless of their level of capability, which is why you need to train everybody, the paramedics, the cops, the sheriffs, everybody. Victims in swift water are either going to be rescued, or not rescued, by whoever is there. And the rescuers are either going to do it right, lose the victim, or become victims themselves. In terms of education, we need to convince people that water rescue has different facets to it. Most people tend to think of water rescue as going out and dragging the lake for a body. With that mind-set, it's not surprising that so many people die. There are a lot of very generalized water rescue courses, most of which are patterned on the old Red Cross water safety course, which is all flat-water. Well, there's flat water, moving water, surf, ice rescue, and all these are different disciplines, with different rules, different PPE (personal protective equipment), different ways of approaching the problem. El Niño has definitely raised awareness about the need for flood rescue, although we've still got a long way to go. With the exception of California, in general, there's very little awareness that something like swiftwater rescue even exists.